Skin is a complex structure and Green Peel® has a complex potential. This method was developed by Dr. Med Christine Schrammek-Drusio before. You will be amazed with these novel care methods. Individual care pan may be scheduled through various and effective herbal mixtures. This natural pant-based formula was developed in accordance with dermatologic principles. A SINGLE METHOD FOR ALL! The “Dr. med. Christine Schrammek derma.cosmetics” brand and the success of GREEN PEEL®, the original method of Dr. med. Christine Schrammek has enabled us to recognize herbal world again. This application is for everyone who wants skin refreshing. Absorption of the skin increases at the end of the procedure and active ingredients may easily penetrate into the skin. An expert consultation should be done before the procedure as in all GREEN PEEL® procedures. Personal data should be recorded. This is a special method which may be applied when you want to have a brighter and fresh skin for a special day. For example, a party of an important work meeting. GREEN PEEL FRESH UP may also be applied for protection of the skin and for prevention of early aging, loss of elasticity. GREEN PEEL ®FRESH UP supports the cells and skin rejuvenation, refreshing and brightening as if a spa care has been applied. The use of Dr. med. Christine Schrammek derma.cosmetics is strongly recommended. The effectiveness of these products were mediacally proven, active ingredients which potentiate each other are formulated. The procedure immediately provides the needed energy. It is an effective method for all skin types which need rejuvenation. It is effective for accelerating blood circulation and metabolism, natural rejuvenation of the skin. FOR WHOM IS GREEN PEEL® ENERGY? GREEN PEEL® ENERGY helps to solve aging-related skin problems. This procedure is particularly recommended for rough, dirty-looking skin which has acne scars and spots. GREEN PEEL® ENERGY is effective for correction of skin appearance and rejuvenation. This procedure should be applied for several times yearly. FOR WHO IS GREEN PEEL® CLASSICAL? 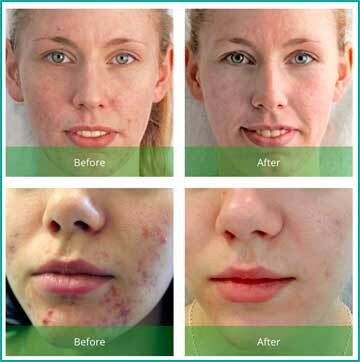 GREEN PEEL® CLASSICAL provides solution for skin problems of face and body. For example large pores, fatty skin, skin which needs rejuvenation and lost elasticity, dull skin with poor circulation, all loose body parts. Every skin problem may not be resolved in or 2 sessions. Every skin reacts differently. The individual skin care may be needed to repeat to achieve the desired result. GREEN PEEL® is a biological peeling application which is applied successfully worldwide. It supports refreshing, rejuvenation and revitalization of skin. Even young skin sometimes needs care. GREEN PEEL® may be applied before the skin begins to age or before development of skin problems. GREEN PEEL® may be applied for reaching a healthy and natural skin appearance. How does GREEN PEEL® show its effect? GREEN PEEL® COMFORT which is a pure herbal mixture which does not contain chemicals accelerates blood circulation and peels epidermis through micro-granules. This intensification induces skin metabolism. So new cell production is supported and the skin is revitalized and rejuvenated. - Accelerates blood circulation: Skin metabolism is accelerated and circulation is regulated. More oxygen and nutrient reach skin and toxins are rapidly eliminated. - Peeling effect: Dead cells in epidermis are eliminated, new cell proliferation in basal layer is induced. Regeneration in upper layers of epidermis and dermis is accelerated. - Collagen production is induced: An improvement is provided in skin structure, color and quality. Skin becomes firmer and wrinkles decrease. - Comedolytic effect: Keratinization reduces through reduced fat in skin with acne and scars. Closed comedoes are opened, tendency to new comedo formation is reduced through a comfortable secretion, some improvement is observed in comedoes. Roughness reduces, color becomes clear, pores become firm, fine lines are reduced and atrophic scars become superficial. What are the conditions in which GREEN PEEL® technique is successfully applied? What are the advantages of GREEN PEEL® application? It is natural, produced from plants. It was developed by doctors. It does not contain harmful chemicals and synthetic abrasives. It does not harm even if it touches eyes. Evident positive outcomes are yielded in 5 days in most cases. Scar does not develop, the procedure does not lead to loss of time or labor. In which regions is GREEN PEEL® applied? GREEN PEEL® may be applied on trunk, abdomen, thigh, arms, legs and also face. How does skin look after GREEN PEEL® application? A mild tenderness and pinkish appearance like sun burn develops after GREEN PEEL® application. Skin is slowly peeled at 3rd and 4th days. The second session is applied at 5th day. Dr. Schrammek products and Super Beauty care are applied to the skin which becomes more absorbable after GREEN PEEL® application. Redness or tenderness does not develop after care. Skin gains a healthier, shiny and clear appearance. Dr. Schrammek Optimum Protection Cream SPF 20 is recommended after the second care. Skin should not be directly exposed to sunlight 4 weeks after applying GREEN PEEL®. Who should not be applied GREEN PEEL®? What are the side effects of GREEN PEEL®? Whether you are allergenic to the plants in GREEN PEEL® should be detected. Tell your doctor if you have the history of allergy. Allergy test may be done before the application if required. GREEN PEEL® is applied to a region 1-2 mm in diameter at wrist. GREEN PEEL® is not proper for you if edema, burnning or itching develop within 24 hours. Tell your doctor about your medications. You should discontinue heparin, aspirin 2-3 days before applying GREEN PEEL®. GREEN PEEL® may not yield apparent outcomes at the first application. Repeated applications may be required.